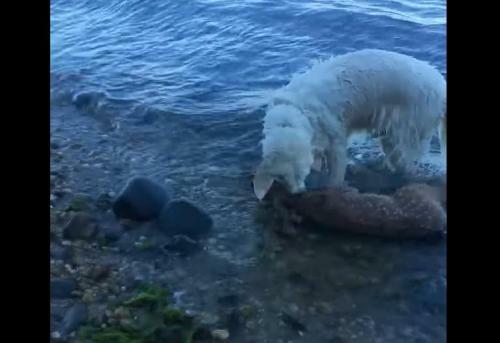 When a young deer got in trouble in the Long Island Sound, it took a surprising team to bring it to safety; first a dog, then a few good Samaritans. As CBS2’s Erin Logan reported, it was all caught on video. The owner of Storm, an English golden retriever, knows he’s loyal and caring, but on Sunday morning, Storm really surprised him. “Storm just plunged into the water and started swimming out to the fawn, grabbed it by the neck, and started swimming to shore,” Mark Freeley said. Freeley recorded the video on his walk with Storm and his other dog Sara, not knowing what would come next. As soon as the fawn reached the shore, Storm followed it, laying down next to the baby deer. “And then he started nudging it, and started pulling it to make sure shew as gonna be OK I guess,” Freeley said. He immediately called the experts to check on the fawn. 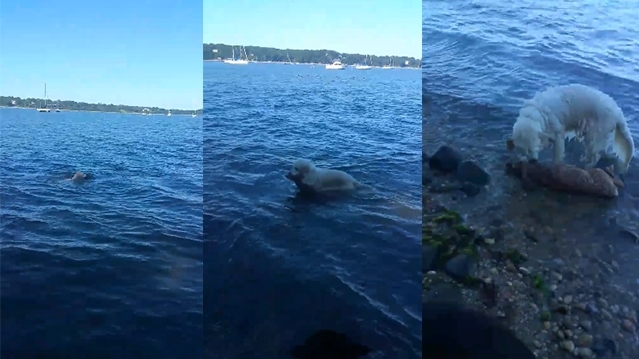 As soon as they started walking on the beach, he said the fawn — likely spooked by the dogs — ran right back in the water. That began rescue round two. “This time it went out even further,” Freeley said. Freeley and Frank Floridia of Strong Island Rescue both waded into the water. Floridia said it took about eight minutes and a rope to get a hold of her. He knew what Storm went through, and felt his pain. “The second rescue was a lot of anxiety,” he said. He credited the difficult part to his partner Eric Kutzing. She ran about a mile on the beach to help. “I don’t think I could’ve done it without the help of my partner. i was exhausted at the point my knee blew out, and I collapsed on the beach,” he said. Kutzing carried the fawn back to the rescue van. She said it was covered in ticks and had an eye injury. The fawn is rescued at an area animal rescue until it can get back on its feet. 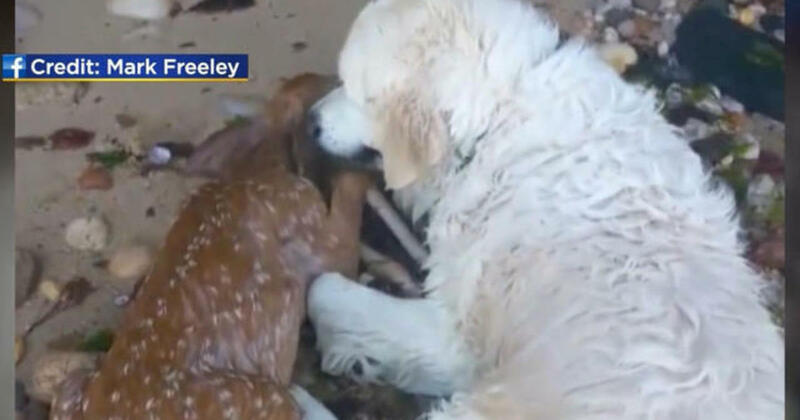 Responses to "Brave golden retriever rescues fawn from drowning"
Wow, that sounds intense! I am so glad they rescued the poor baby. It made it but not with any help of the dog owner. Cripes, why didn't he make the dog leave it alone. It was not nudging to get it to move but to make it run so it could chase it. Don't put human actions onto animals.